Dr Dwaine Allison, D.C.'s mantra "feel it - fix it"
How chiropractor and vocal coach got together for synergy and mutual benefit. How Dr. Allison's chiropractic and wellness work helps the voice. He assesses, recommends changes and improves the general health of the body which houses the voice. The 7 pillars of wellness he addresses: Exercise, Posture, Nutrition, Hydration, Rest and relaxation, Mental state, Neurological condition. Assessment of the patient to determine strategy of improvement. Getting rid of bad habits, unloading baggage, taking your foot of the brake so you can go forward. Checking posture, and why both chiropractor and vocal coach do this. Windows to your health that Dr. Allison checks, including the vital state of your posture. What forward leaning posture does to sabotage health, just as it sabotages the voice by interfering with open throat and breath control. How Dr. Allison works to change alignment. Strategies in addition to chiropractic that he uses including frequency therapies and chi gong. We discussed the diaphragm and the lungs, also the torso, pelvic, cervical and thoracic vertebrae. We got into the trigeminal nerve, the jaw including tension in the platysma and how to release it. He takes us through a few wonderful, very effective stretches to counteract specific areas of tension. You'll find yourself moving with the discussion! The essential change tool of awareness. Feldenkrais and Alexander technique and how they can increase muscular efficiency. Dr. Dwaine Allison, has been in private practice since graduating from Texas Chiropractic College in 1985. He has given some three quarters of a million individual treatments. His first in Tyler and Ft. Worth, Texas, and now in Franklin Tennessee, where I am among his patients. Born legally blind, he has overcome huge hurdles in his life to become a well-respected Chiropractor, public speaker, and singer/songwriter/performer. Dr. Allison is a true community leader. Check out his website to see the organizations who have him on their Boards, the positions he has held including district president for the Texas and Tennessee Chiropractic associations, his appearances on TV and radio, and the incredible volunteer and educational work he has done. Some of his ‘other’ interests include marathon running, guitar, songwriting, hiking, chess, table tennis, travel, foreign language and culture, human development and empowerment, public speaking, writing, unicycling, and martial arts! He and his equally amazing wife Rita have 6 children, some of whom have studied voice with me. I had the pleasure of producing an album of his original music. 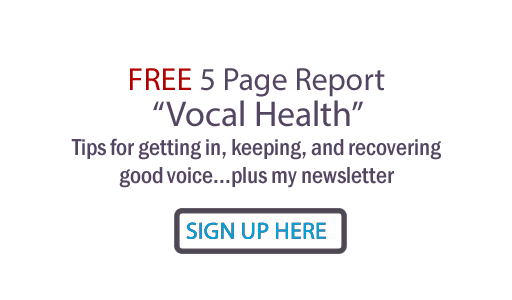 He is a truly gifted and insightful healer and the things I've learned from him over the years have helped make me a better and more effective vocal coach. Dr. Allison's office is in Franklin, Tn. Learn more and contact him at his website www.FranklinChiropractic.net. If you like this podcast, please leave a review - it would be extremely helpful, especially at iTunes!